Solar wind flowing from the indicated coronal hole should reach Earth on Jan. 28-29. Credit: SDO/AIA. 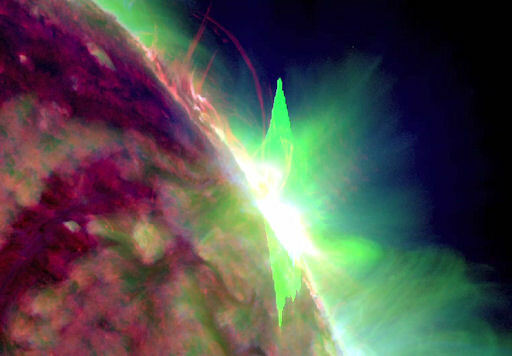 Sunspot 1402 is rotating onto the far side of the sun, so the blast site was not facing Earth. Nevertheless, energetic protons accelerated by the blast are now surrounding our planet, and an intensifying S1-class radiation storm is in progress. The explosion also produced a spectacular coronal mass ejection (CME): SOHO movie. Analysts at the Goddard Space Weather Lab say the cloud raced away from the sun at 2500 km/s or 5.6 million mph. The CME is not heading toward Earth, although it is too soon to rule out some kind of glancing blow on Jan. 28-29. Stay tuned for updates. Solar flare alerts: text, voice. 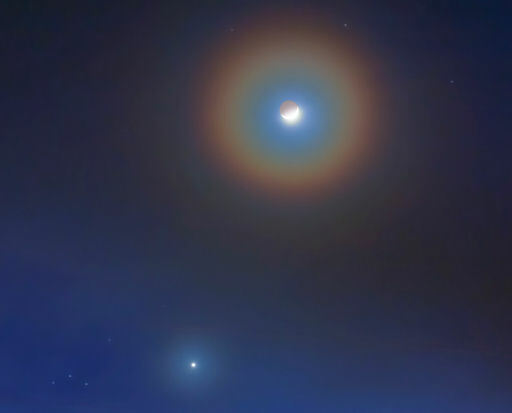 Coronas are caused by tiny water droplets in thin clouds, which diffract the light of bright heavenly bodies to produce iridescent halos, as shown above. Seeing one corona in the night sky is not uncommon; however, seeing two in close proximity is a rare treat. Another "corona conjunction" could be in the offing. The Moon is moving past Venus for a meet-up with Jupiter on Jan. 29th. If the two align behind a moist, thin cloud--voilà! 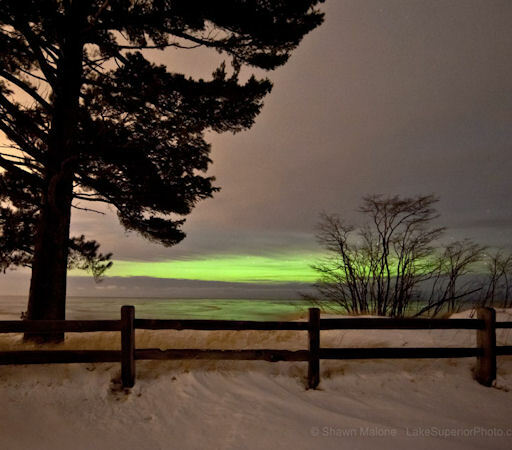 "I got to view a slice of the aurora through a tiny opening in an otherwise completely overcast sky," says Malone. "It appeared to be a pretty decent display." Prompted by the CME warning, Mike Hollingshead of Nebraska drove 450 miles to the Badlands National Park of South Dakota hoping to catch a glimpse of the auroras. He got more than he bargained for: "While I waited for some sign of auroras, the most amazing fireball I've ever seen blasts down. It flashed brightly and illuminated the terrain around me." Later, the auroras made a belated appearance, turning the badland sky green. More auroras could be in the offing. A solar wind stream is heading for Earth, due to arrive on Jan. 28-29. NOAA forecasters estimate a 15% chance of geomagnetic storms at high latitudes. Aurora alerts: text, voice. On January 27, 2012 there were 1272 potentially hazardous asteroids.